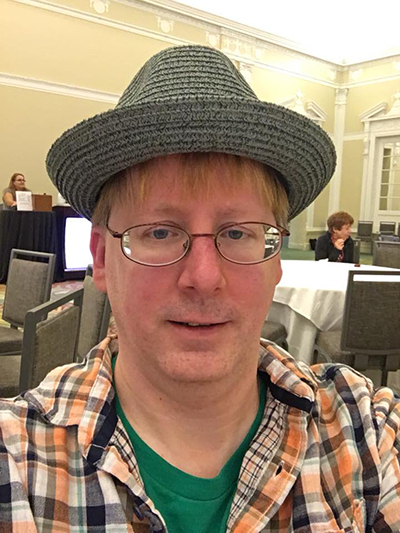 My annual recap of Bouchercon is always a joy to write. Revisiting those events helps to elevate the sadness caused by it all being over for another 365+ days. But next year, we have Dallas and the 50th Anniversary of Bouchercon! After a brief Labor Day vacation in Saint Augustine, Florida, Michael and I made our way to St. Petersburg on Tuesday, September 4. The Vinoy Hotel was as glamorous as expected and we were surprised that we were able to complete our check-in at noon. Then it was off to lunch at the Annex with our friends Erin and Karen, before heading back to the Vinoy Terrace Bar for a Froze. Much mingling happened and I was so happy to get hugs from so many folks whom I only get to see this one time a year. Because of Ayo Onatade’s recommendation, dinner was at Bella Brava, a delicious Italian Restaurant a few blocks from the hotel. We ended our evening with a tour of the hotel and convention layout so that we were ready for the coming adventure. Wednesday morning found us making our only drive of the convention weekend. We went out to Pass-a-Grille beach to have a no-frills, but delicious, breakfast at The Seahorse Restaurant (a recommendation from Lori Roy and Cheryl Hollon). An extended walk on the beach followed this meal, where we collected seashells for my friend’s daughter back at home. It was a super relaxing calm before the storm that is Bouchercon began. Once back at the hotel, we decided to complete our registration and pick up our complimentary book bags. This year, the bags were stuffed to the gills with somewhere in the vicinity of 9-10 books each, plus exclusive short stories by Lisa Unger and Sara Blaedel. After we sorted through those books, traded, and dropped off books that were not of interest – mainly because we had already read them – it was time to take the Looper around St. Pete’s. Our main destination was The Dali Museum and it did not disappoint. The free docent led tour was excellent and added so much depth to paintings that would impressive even without the extensive background information. Lunch in their café was delicious and very reasonably priced for a museum eatery. Then it was back on the Looper for the rest of the city tour and back to The Vinoy. Wednesday night dinner was at the St. Petersburg Yacht Club – for the Guest of Honor and Planning Committee celebration. 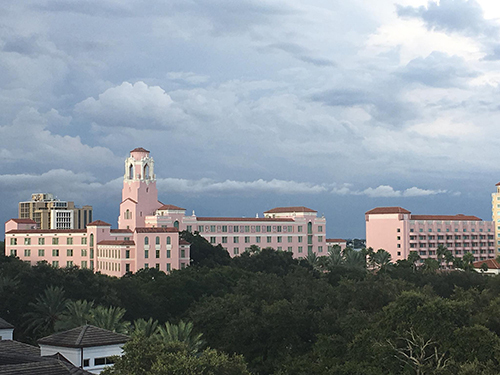 The view from the room was wonderful, food was tasty, and it was fun to share the table with Christy Campbell (volunteer coordinator), Eric Campbell (from Down & Out Books), and Colette Bancroft (one of my favorite book reviewers from the Tampa Bay Times). 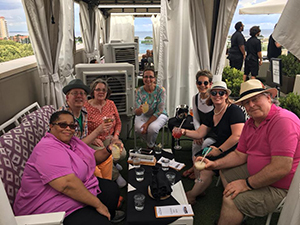 After a leisurely stroll back to The Vinoy, we ended the evening with drinks (two Naomis) on the hotel terrace and chatting about all manner of topics. Thursday morning found me at the Coat of Many Colors panel where 20+ authors recommended under-appreciated and diverse authors/books. This event started off a bit rough because not all the expected authors were able to attended, but make no mistake about it, readers left with a hefty list of books to check out – and that is the most important thing. This was followed by the first of many trips to the book room. Because you don’t always have to stay in a room when a panel doesn’t connect with you, we skipped out of one room and caught the end of the Journalist panel (mainly to see LynDee Walker). Pistols Not Parasols – Strong Female Characters, which proved to be one of the best panels of the weekend, followed this. Nadine Nettmann handled her first moderating gig with skill and panelists Sara Blaedel, Elly Griffiths, Nic Joseph (another book I marked as a MUST READ), Amy Stewart, and Lesley Thomson entertained the audience. Then it was time to chill a bit before the panel I moderated. 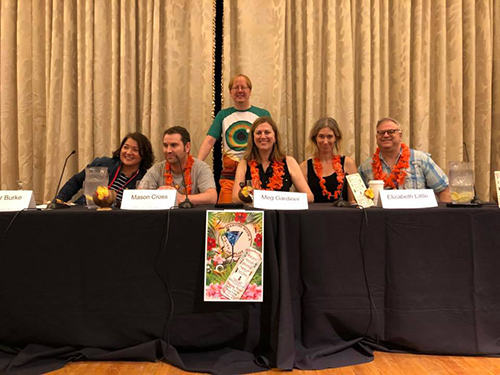 A Martini with a Twist of Plot – Thrillers with panelists Alafair Burke, Mason Cross, Meg Gardiner, Elizabeth Little, and Neil S. Plakcy seemed to be enjoyed by a large crowd. When you are up there, it’s hard to tell how things are going, but I heard some wonderful praise about it over the course of the weekend, so I think it was a success. We then stuck around to hear two of my favorite authors, Lisa Unger interviewing Sara Blaedel. We ended that panel-going day with one of the two LGBTQ+ panels held this year. Dana Kaye moderated Brenda Buchanan, John Copenhaver, Stephanie Gayle, JM Redmann, and Alison Solomon. Like last year, the audience for this was very healthy and I think many readers came away with new insight into the topic. Despite starving, we headed to the opening ceremonies where we were delighted to find cupcakes!! After a brief stop at the opening reception so that I could snag a copy of Carol Goodman’s new book, it was way past time for dinner. I think we ate at a pizza place/tap room that night. Friday morning kicked off bright and early with the New Author Breakfast, which Michael and I coordinated. We may be excessive planners, but I have to say this event came off without a hitch. All the expected authors showed up and presented to a packed ballroom. I know from chatting with many folks that To-Be-Read piles seriously increased after this event. Even I walked away having to grab a copy of Lloyd Otis’ Dead Lands. I had every intention of catching some panels after this, but that was not to be. Talking with folks in the hallway was the task du jour. I did make a point of going to the very well-attended Members Meeting. Future Bouchercons – New Orleans and Minneapolis – were approved and voting for new board members took place. Then it was time to see the iconic Michael Connolly (author of the Bosch series) interview the always-hilarious Mark Billingham (author of the Tom Thorne series). I dashed off to make an appearance at the HarperCollins cocktail party – where I talked with the charming Bruce Robert Coffin and one of my favorite new authors Caz Frear. This was also my first chance to get a hug from Lori Rader-Day. The Speed Dating Breakfast launched our Saturday. Thankfully this also came off without many issues. This is probably the most demanding of events, with many moving parts. I am happy to have had the experience, but I don’t think I will be running that one again anytime soon. That said, everyone loved it and much swag was handed out. Afterwards, I just needed to decompress, so I spend some time in the hallways chatting, shopping the book room, and just milling about. My next panel was another favorite: David Brown moderating William Kent Krueger, Mindy Mejia, and Christine Carbo. They were discussing location as character in wilderness settings. Once again, cupcakes appeared out of the heavens as we made our way over the panel featuring Judy Bobalik, Cara Black, Lesa Holstine, Harry Hunsicker, Marv Lachman, and Hank Phillippi Ryan. William Kent Krueger moderated this interesting panel that featured many laughs and a nice celebration of our community. It was an honor just to be nominated against folks who I consider some of the most important people in my crime fiction life: Dru Ann – I love you more than you can ever know and calling you friend is a joy that never ends. I spend every morning with the Jungle Reds and the community they have built. Do Some Damage features some of my favorite writers and always has a deep dive conversation into both the literary world and the world at large. And Podcasts are the up-and-coming new media outlet that everyone should be experiencing. The Writer Types Podcast is a first class example and Eric and S. W. are first class gentlemen. I would also have thanked some very important folks instrumental to my crime fiction journey. Erin Mitchell – you have been there from the beginning and always with a helping hand. Judy Bobalik – who put me on my first panel and who has become a dear, dear friend. Jon Jordan, George Easter, Larry Gandle, and Ali Karim – who saw the value of my reviews and agreed to run them in their publications. 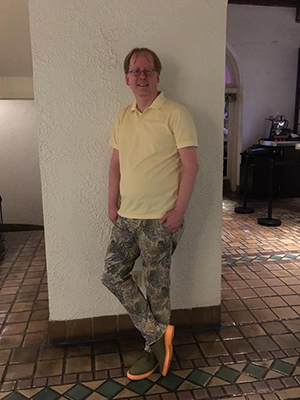 And, of course, my husband, Michael – perfect in every way. After the awards, it was off to Paul’s Landing for a drink and some literary talk. It was the perfect end to a very busy day. Sunday morning I slept in, but made it down for another excellent panel. Ragnar Jonasson moderated the likes of Catriona McPherson, Lori Rader-Day, Ivy Pochoda, Matthew Clemens, and David Ball. The topic was Stand-alones vs. Series and the discussion was eye-opening, funny as hell, and just down-right inspiring. Since I ended Malice this year with a panel featuring Lori and Catriona, I would like to make that a requirement for all future conventions. All in all, a great time! 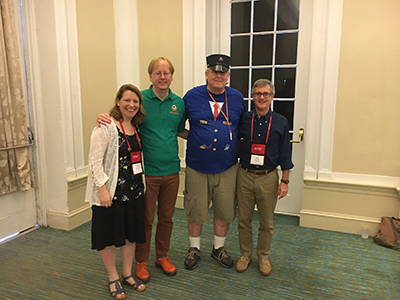 Bouchercon 2018 was a success and it’s onward to 2019 in Dallas. You are Michael are both dolls! Thanks for making the New Author’s Breakfast and Speed Dating successful for us this year! One hug is not enough! Congrats on your nomination, friend. I completely agree. Congratulations on your much-deserved win for Best Paperback Original. It was a wonderful, quirky town. I loved it. You and Michael are rock stars, as far as I’m concerned! 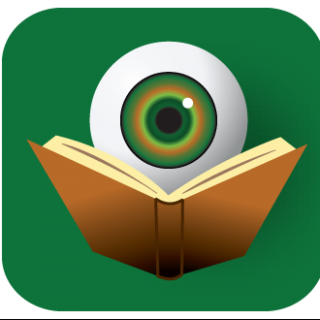 Looking forward to seeing you at Malice – and then Dallas! (We will need to meet at a palace after that.) I owe you two a lunch! Thanks for being a friend and a lovely non-acceptance speech. And also thanks for bring the creative Michael into my life as well.